I can’t believe how fast time is flying, one of my most favorite holidays are rapidly approaching! I know that when I tell some people that, I get a major eye roll in response, guess I’m just a romantic what can I say?! Valentine’s Day is supposed to revolve around love, so to me it doesn’t matter if you’re single or in a relationship, there is still plenty ways to enjoy the day. If you’re in a relationship, you’ll celebrate with your significant other and if you’re single you’ll spend it with the ladies (Galentine’s Day!) – either way it’s supposed to be a time of love and celebrations with the ones you love and who love you. The concept of Valentine’s Day has actually been around since the Middle Ages but wasn’t made popular in the USA until about the 1700s, and then massively popular in the 1840s.I feel like in recent years, Valentine’s Day has gained more and more momentum, like there are some really unique ways people have begun to celebrate it. Of course I like to be wined and dined, but I am not one to turn down a nice night in. Check out some ideas for plans, gifts, and celebrations! I love surprises, so when she starts asking about V-Day plans (she will), try to keep it vague, maybe just a “put on that red dress and I’ll pick you up at 8”. Hot damn. I would definitely choose a restaurant that is intimate and romantic. Your gal def does not want to be taken to Applebee’s on V-Day! Perhaps one of your favorite restaurants, where you had your first date, her favorite cuisine, a place with a view, etc. V-Day seems to be a day where we go a little bit more above and beyond. Treating her to a nice dinner doesn’t mean fancy, but perhaps a step above of what you two usually do. Since it falls on a Tuesday this year, celebrations typically take place the weekend prior. After dinner nightcaps are always a safe bet, or if you’re at a place with a view, take a romantic stroll. Homemade dinner + romantic playlist. This may seem really easy, but making it the perfect, candlelit dinner is actually pretty hard – from the set-up, the mood, the food, it’s a bit nerve wracking! If you’re not a chef, I’d say give it the ol’ college try. She will def appreciate the effort moreso than the taste (or at least she should lol). But, if you’re really just a hazard in the kitchen, maybe order some take-out from her favorite restaurant, or her favorite dish and plate it nicely. Don’t forget the candles, and spreading some rose petals is a beautiful touch! Have the vino poured and the playlist in the background and the mood is set. For the playlist, Spotify has some great playlists you can choose from, or you can make your own and fill it with your favorite songs. Here are some Pinterest ideas for recipes and table settings! 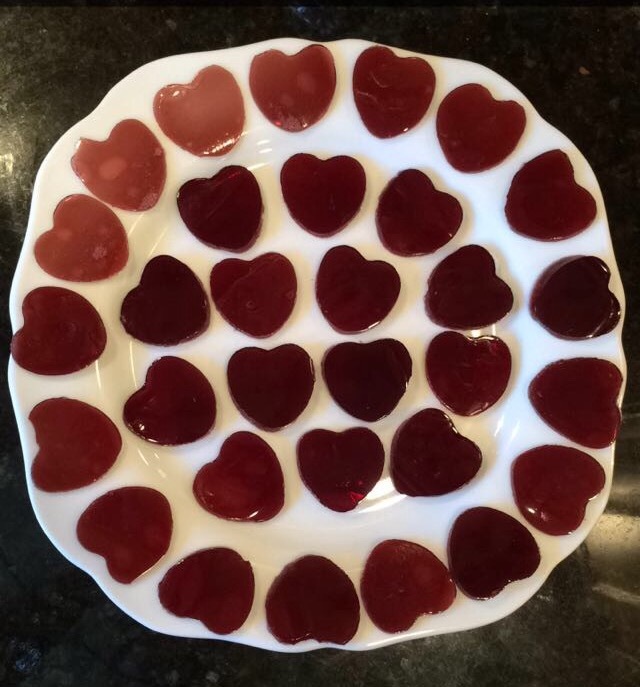 Wine Gummies – I will have a recipe on this shortly! Yasssss! So the hardest part about this is going to be gathering all the girls. Once that is done, it is an absolute breeze. Stock up on some wine, some bubbly, cute decorations, tapas, and get a super upbeat playlist. No sad movies and ice cream! Also a Polaroid camera can make for some great instant pictures! There are little quizzes you can do, little favors like nail polish you can hand out. Check out some ideas below! Gift Guide – this is basically the most important part of the article haha! To me, V-Day gifts are supposed to reflect on the love you share and is something that is sentimental. It doesn’t have to be some lavish thing. I would suggest something like a piece of jewelry, a LoveBook, something personalized, something that means a lot to her. A gift to both you and her would be lingerie hahah! You can do earring, a watch, a ring or promise ring. Well usually Valentine’s Day is a holiday for the ladies, but the guy should get some credit too! Cologne – this smells so sexual and doesn’t break the bank like Creed does. A date of something HE wants – maybe going to a racetrack, seeing a movie he likes, a restaurant he likes, etc.